3 years ago today, I gave birth to my first child. A beautiful little girl weighing only 6 pounds 6 ounces (2.9kg). We named her Lily Mae Tasker, and she had blue eyes and dark hair with little ginger tips. She came on her due date, and she was lovely. She is full of life, and has brought great happiness to our little lives! She is funny, witty and absolutely gorgeous, and I feel blessed to have her in my life. 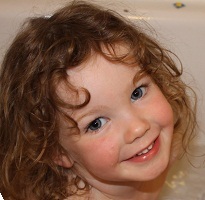 Today, my little girl turns 3, and has never been more loved, more funny, more witty or more beautiful. It has been a long road here, full of many trials and errors and many more successes, and I am loving watching her nurturing instinct come out in caring for her baby brother, she is just amazing. Happy Birthday my not-so-little girl. We love you very much! She is such a beautiful wee girl! Congrats on getting through 3 years!